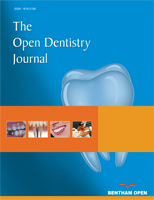 The purpose of this study was to evaluate the efficacy of a Light Emitting Diode (LED) System (BriteWhite) on tooth bleaching. Method: eeth 11 and 21 of twenty one subjects were treated in the chair with a LED light and 44% carbamide peroxide gel, followed by an at-home treatment period of 14 days with 35% carbamide peroxide. The color of the teeth was measured with a spectrophotometer (L*; a*; b*) before treatment (control) and after the above mentioned two stages. The subjects were also instructed to note tooth and gingival sensitivity. Results: For the L* component a statistically significant difference (p<0.05) between base-line and directly after the LED treatment stage (whiter) was found and a complete relapse was found after the 14 day at-home treatment period. The b* component showed statistically significant differences (p<0.05) between base-line and the LED stage (less yellow more blue), with a further significant color improvement after the 14 day treatment period. For the a* component (green to red) no statistically significant change was (p>0.05) found throughout the study (Wilcox on Signed Rank Sum Test). A major color change of 1.8 units (ΔEab) was found after the LED treatment stage with only a further small 0.2 unit improvement after the 14 day at-home treatment stage. Tooth and gingival sensitivity scores were low (below mild) throughout the treatment stages. Conclusion: A major tooth color increase was found after the in-office LED/gel treatment stage and only an insignificant further improvement was noted after the additional 14 day at-home treatment period. Only low tooth and gingival sensitivity scores were found. A slight increase in both the sensitivity and gingival scores after the LED/gel activated stage could be observed. Overall the total color increase was low. Keywords: BriteWhite system, LED light, spectrophotometer, tooth whitener. © Hayward et al. ; Licensee Bentham Open.